MISSISSIPPI STATE -- Catfish research at Mississippi State University is no surprise given that Mississippi leads the nation in catfish production, but the potential applications of that research through the College of Veterinary Medicine’s fish hatchery are another story. As the state’s land-grant university, MSU conducts research that benefits this valuable aquaculture industry and consumers. While some of that research can take place in farm ponds, other studies require fish with known health histories. A decade ago, MSU received funding to create a fish hatchery to raise SPF channel catfish. Catfish research focuses on infectious diseases that cause substantial losses to the state’s channel catfish industry. Research also explores parasites, viruses, catfish botulism and the development of vaccines. MSU researchers are also rearing killifish and mutant zebrafish for potential breakthroughs in illnesses such as cancer, Parkinson’s and other diseases. MSU is one of a few fish hatcheries in the world using these species for research. Petrie-Hanson uses zebrafish to study how the immune system fights infection. Petrie-Hanson said white blood cells provide immune defenses. A type of white blood cells, lymphocytes, protect against diseases after vaccinations. Mutant zebrafish, which do not have lymphocytes, offer unique insights into the immune system and vaccine development. Petrie-Hanson has discovered that fish without lymphocytes can be vaccinated effectively. “This discovery challenges long-standing beliefs held by scientists, and it is encouraging for individuals with compromised immune systems,” she said. Researchers at the College of Veterinary Medicine seek similar breakthroughs every day. South African killifish were chosen for human-animal biomedical research because of the uniqueness of their short life cycle. They progress through a lifetime in just three months, which allows scientists to see the effects of various compounds during different life stages. Dr. Russell Carr, associate professor of basic sciences, said some strains of killifish have longer life cycles than others. The MSU fish hatchery staff focused initial efforts on rearing the strains with longer life spans, which allowed staff to perfect their husbandry skills. Then they began rearing the killifish with shorter life spans, which are more difficult to grow. MSU researchers are building their killifish population to have enough for studies on how early life exposures to environmental chemicals impact later brain function. In addition to producing generations of fish, MSU also raises the food for the killifish and zebrafish. 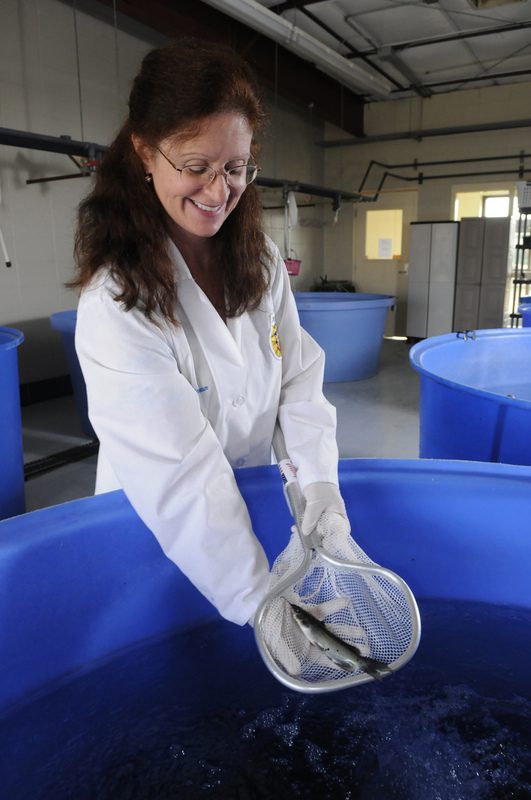 When the fish reach the proper age for research projects, they are moved from the hatchery, located just south of the veterinary college, into laboratories in the Wise Center. The aquatic animal research program at the CVM is fully accredited by the Association for Assessment and Accreditation of Laboratory Animal Care. Dr. Kent Hoblet, dean of MSU’s College of Veterinary Medicine, said the hatchery and the research it supports are points of pride for the university. “Most people don’t realize what we have and the potential breakthroughs that may result from the research that can be conducted with the fish reared in our hatchery,” Hoblet said.